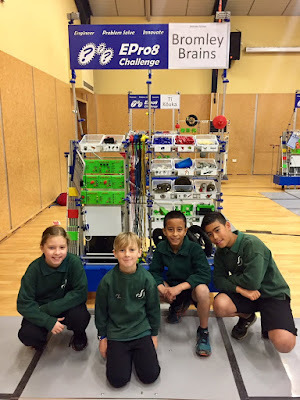 Koru 1 Bromley: Good Luck To The Bromley Brains! Good Luck To The Bromley Brains! We are really excited to have our Year 5 team, the Bromley Brains, taking part in the Canterbury ePro8 semi finals this coming Thursday. This is an engineering competition, in which the team qualified by coming 4th out of 12 teams in the regional heats a couple of weeks ago. We also had another team, the Year 6 Bromley Coders, who performed admirably but unfortunately missed out on qualifying for the next round. The Bromley Brains worked so well together and no doubt will have a fun, but intensely challenging time again this week. We look forward to seeing how you go!